Spring in the White Mountains is here! After a long snowy winter many climbers and hikers are chomping at the chance to get on some dry rock climbing, hiking, mountain biking, and trail running. Unfortunately in a couple more weeks many insects will be chomping at the chance to chomp on us! Get your bug defense program up and running before “Black Fly Season” gets underway! Black flies try to fly away with Tom while rock climbing in the White Mountains. How many can you count? In this post I’d like to share some time tested strategies to keep the dreaded “bug season” from keeping you from enjoying what it is you do in the mountains. To combat these little buggers we will use a four-pronged approach! Clothing, Repellent, Timing, Location. The first line of defense should be clothing. Everyone knows long-sleeves and pants are preferable for bug protection but they seem so hot when the temperature and humidity is high right? Some long-sleeve options actually feel cooler than going shirtless! Here’s my current favorite tops when dealing with an onslaught of bloodthirsty insects and warm temps! These two pieces are super breathable and basically come with me on every adventure from April to September! For some lightweight breathable hiking and climbing pants check out the ExOfficio BugsAway Sol Cool Ampario Pants. We will look at two layers of repellant. One for your clothing/gear and one for your skin. Without question the most effective insect repellent is permethrin. I’ve used this for over two decades and its effectiveness was proven time and time again from jungle warfare training outside of Iquitos, Peru to the northern jungle of Okinawa, Japan. 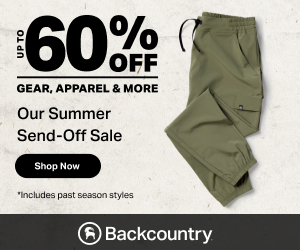 Some clothes like the ExOfficio BugsAway Ventana Jacket and the Royal Robbins Bug Barrier Traveler Pants come pre-treated with permethrin for convenience. You can also just buy a bottle of it to treat the clothing your already own. I treat a couple pairs of climbing pants every Spring and my approach shoes and haven’t had a tick attach to me in years! Between wearing the proper clothing and treating it with Permethrin I rarely need to apply DEET to stay bite free but I do carry it as insurance during the worst feeding frenzies. A small application behind the ears and back of the neck can make leading a rock climb much more bare-able when those alpine gnats come out. Since I use it sparingly I tend to only pack the smallest of bottles like this great .5 ounce one from Sawyer. There are lots of size options for both spray and time-released lotions on Amazon. Finally timing and location can help avoid the little nasties. Mosquitoes are most active at dawn and dusk so you could plan to be inside during those times. If you only have time to climb around dusk you could pick crags with consistent breezes. Some of my favorite destinations during the peak feeding season are Square Ledge in Pinkham Notch, Profile Cliff in Franconia Notch, Table Mountain off of Bear Notch Rd., and higher elevation stuff like Huntington Ravine (beware of those alpine gnats though). Avoid the low lying swampy areas during peak feeding times. Pawtuckaway State Park, Stonehouse Pond, Longstack, lower Shell Pond, and even the North End of Cathedral Ledge can all be particularly nasty just before dusk during the peak feeding season. If you are walking through fields or tall grass on your hike out just assume you’ll pick up a few ticks and do a quick check at the car. I once skipped a tick check before driving home from a hike in Madison, NH and discovered 7 ticks crawling up my bare legs while driving (I wasn’t wearing my treated hiking shoes that day or wearing any repellent). You can pick up most of the DEET and Permethrin products I suggested and support local businesses while in the White Mountains at these great shops! Southern New England is already seeing the tick and mosquitoes appear which means we only have a week or two in the White Mountains before bug biting season starts for us. Now is the time to shore up your insect defense plan! To get your started you can enter to win a 3 oz bottle of Sawyer Premium Maxi DEET Insect Repellant. You can enter multiple ways through this link below! I’ve had three full winter seasons testing the lofty Patagonia Fitz Roy Down Parka and it has been a consistent performer in the category of down belay jackets. Let’s take an in-depth look at the good and the bad and determine if this is the right choice for you! It is important when comparing down jackets that you consider both the fill power of the down (generally 700+ is used in higher end pieces), and the actual amount of down used (generally varies from 2-8 ounces). The Patagonia Fitz Roy Parka is stuffed with 6.4 ounces of ethically sourced 800 fill goose down. This is a very generous amount of the heat-retaining-super-lightweight-and-compressible natural insulator! Similar priced models from other manufacturers often have 4-5 ounces of down (if you can even find out from them). What this means is this “puffy” really is “puffy”. It feels like a big down sleeping bag that fits over all of my other layers (including soft-shell or hard-shell jackets). Baffled construction on the core and quilted construction on the arms keep this quality down where it is needed and eliminates “cold spots”. I’ve worn this now in ambient air temps down to -16°F (-26°C) with wind-chills between -30°F to -40°F below zero (-34°C to -40°C)! When worn over my typical winter mountaineering layers I’ve stayed toasty teaching avalanche courses, camping at 11,000 feet in the Cascades, and belaying partners on long pitches of technical ice climbing. It is without a doubt a toasty pound and a half part of my clothing system! At only one pound six ounces (about 620 grams) this is the lightest full winter belay jacket I’ve tested! It also packs down into a very small stuff sack to maximize the available space in your smaller ice & alpine climbing packs. I lost the original stuff sack that came with the jacket but upgraded (and downsized from the original) to this amazing Hyperlight Mountain Gear waterproof stuff sack! Patagonia uses a really silky and thin Pertex Quantum® fabric with DWR (durable water repellent) finish to fend off moisture. This is a positive for making this puffy extremely light-weight, pack-able, and breath-able. However it also makes this piece most suitable for extreme cold conditions when liquid precipitation is pretty much out of the question. If the forecast calls for “mixed” or freezing rain I’d suggest reaching for a heavier less pack-able synthetic belay jacket (like the recently reviewed Outdoor Research Perch). Basically don’t expect this shell material to resist much liquid water. I managed to soak mine in a dripping ice cave while ice climbing on an unseasonably warm day and it was clear this piece is better designed for arctic cold dry days and not warm/damp days. It did however regain full loft when dried that evening! Another cold day on Mount Washington with the Patagonia Fitz Roy Parka keeping me happy & warm! I went with a size large for my 180 pounds, 5′ 9″, 42 inch chest, 34 inch waist build and it fits great over my typical winter ice climbing/mountaineering/back-country ski clothing kits. The hood is the perfect size for fitting over my climbing/mountaineering helmet and a drawcord on the back pulls the sides back so you don’t feel like you are wearing horse blinders. The elastic wrists have the right amount of tension, hand-warming pockets are properly sized and positioned a little higher to be harness friendly. A bottom hem draw-cord helps keep heat from escaping out below and the front zipper runs high enough into the collar/hood area that I can go into “full turtle mode” when it is really too cold to be outside. Rounding out the features a small chest pocket keeps my phone & lip balm handy and a large stretchy internal pocket on the right side will keep your gloves or mittens warm and dry (and prevent them from blowing away) while you attend to what ever fine dexterity task crops up. This is one of the best down belay jackets out there at a fair price, especially when considering the amount and quality of the down Patagonia used. While there are some durability concerns with a piece made with such silky then fabrics (especially considering all the sharp stuff ice climbers carry) my parka only has two pea sized holes in it after 2 seasons which were easily patched with my favorite field repair stuff, Tenacious Tape. If you are in the market for a lofty warm down belay jacket this one should be on your radar! You can also save some money buying one of these now as most retailers have them on sale as we quickly approach Spring however inventory is really low! Check out the lowest prices at the links below! I will re-post this next Fall when the new colors & inventory hits the market! New colors and inventory have arrived! Last year I got to review the iconic Patagonia Nano Puff Hoody, undeniably one of the “best in class” pieces of outdoor clothing on the market. This year Patagonia has taken this iconic piece and optimized it with a new “PlumaFill” synthetic insulation that really gives natural down insulated pieces a run for the money. Instead of lamenting over every minutia detail I’m going to call attention to the differences in this new option over the tried-and-true Nano-Puff Hoody that many of us are familiar with (especially if you read my aforementioned review). “PlumaFill”… what is it? Google searches will lead you to other positive reviews of this jacket but for the sake of time I will tell you it is the closest insulation I have experienced to good ole’ goose down with the added benefit of still “working” when it gets wet. I’ve asked a few experienced outdoor retail friends to guess the insulation by “feel” and they all thought this was a down piece. Its perceived “warmth” is definitely competitive with any down option at this weight on the market! My size large weights 9.5 ounces. It’s almost laughable that something that can retain this much heat can weigh that little. Seriously? I can pack this into a 22 ounce water bottle! While it is with out a doubt ultra-light weight and compressible I would still caution that this is a “light puffy”. Don’t expect it to be your sole belay jacket on Cannon Cliff or Lake Willoughby…but… at the weight & low packing space this is a piece that could live in your pack for all those “I wish I had a little more warmth” moments. The Patagonia Nano Puff® Hoody used a 1.4-oz 22-denier that felt like silk. The new Mirco Puff uses a .7-oz 10-denier 100% nylon ripstop Pertex Quantum® with the same DWR (durable waterproof repellent) finish. What does that mean? Well silky got silkier and the shell fabric is basically half as thick as the iconic Nano Puff. We are probably giving up some durability here at the benefit of weight/pack-ability… but for many of us that is a welcome trade. The new Micro Puff Hoody saves you about 3 ounces for an equal amount of environmental cold protection. That’s a $50 price increase for 3 ounces and maybe 20 cubic inches of packing space (they both back into smaller than a water bottle packages). “PlumaFill” seems to be the closest anyone has been able to get to the weight vs. warmth of natural down, but the PrimaLoft Gold used in the original Nano Puff Hoody is still a strong contender in the arena. I guess the bottom line is both of these are pretty darn amazing options and it’s up to you if the 3 ounce savings is worth the extra moo-laa. I hope this brief review helps you decide! As the year draws to an end I’m looking back at the plethora of amazing advancements in the field of climbing gear and clothing this past season and calling out some of the best stuff I got to review this year that has become a permanent addition to my kit. Check them out below! A fantastic update to what was already one of the most competitive climbing helmets on the market I went into great detail of the changes in my review here. Without a doubt the most sleek and comfortable ice climbing boots I have ever worn. From Mount Rainier to Grade 5 waterfall ice in New England these have been a serious joy to wear. See my detailed review here. From Spring rock climbing in New England, Summer alpine climbing in the Cascades, to warmer winter ice climbing, these pants came in clutch this past year. Check out my full review here. There’s a lot to love about the safety improvements to the iconic GriGri with the new “+” version. My favorite feature is definitely the fact that this device is engineered to work with any single rated rope on the market so I don’t need to think about whether my ropes are too skinny to use with this device. See my long review on this advancement here. While these amazing ice tools have been around for awhile Cassin just released some more customization options including an alpine handle and two new pick options! Details in my review here. I ran some numbers and did some comparing against other popular models of this screw here. While I deal with the “sticky screw” placement from time to time these still make up the bulk of my ice rack! A lot of great skins hit the market late last winter and I got to test three of the top models! Check out the results here! This set up absolutely slays the uphill skinning yet performs quite impressively on the descent. I logged over 50,000 feet of skiing this rig last season and I couldn’t have been happier. Bonus that the Arcteryx Procline Carbon Ski Boots could also climb technical ice! Well there you have it, 8 of my favorite climbing (and skiing) pieces of gear and clothing from the past year. I can’t wait to see what 2018 brings! What was your favorite piece of new gear from last season? Let me know in the comments below! P.S. Still shopping for the climbers in your life? Check out my hand-selected Holiday Shopping Guide! I’ve been wearing the Black Diamond Alpine Softshell pants almost daily for the last 5 months and have been really happy with their performance. A true three season pant I’ve worn them on sunny low 70’s days rock climbing on Whitehorse Ledge, blustery Mount Washington ascents (including my two hour car to car of Pinnacle), late season ice climbing, and summer alpine climbing in the Cascades. These were the only pant I wore for successful summits of Mount Shuksan, Forbidden Peak, and Mount Rainier. All told they have seen over 200 miles of hiking and 30,000 feet of climbing and still look and perform great! Let’s take a look at why these are suitable for such a wide variety of adventures! Probably the best feature of these pants is how they have a very large range of temperature comfort. This is primarily achieved by Black Diamond’s proprietary four-way stretch fabric (88% nylon, 12% elastane) with a DWR finish. The material is soft enough on the inside that it feels great on bare legs and so breath-able that I could wear them on high humidity warm days during bug season without any discomfort. I actually found myself not climbing in shorts this season because I liked the added protection of a full pant like this pretty much every time I headed into the woods. Despite being so comfortable in warm and humid conditions the DWR treatment and weight of the material offered enough protection for them to be perfect in blustery alpine climbing conditions. I wore them exclusively for all three summits mentioned above and they were perfect even for our 1 AM below freezing alpine starts. A lightweight or mid-weight long underwear pant can easily expand the cold weather capabilities of these though I would pack a hard-shell to zip on over them in extreme cold/windchill/wet conditions. The second best feature of these pants is how well they fit. For reference I am 5′ 9″, 180 pounds, with a 34 inch waist and 32 inch inseam. I went with a size medium and they fit me quite well. They may be an inch long in the inseam but that is only noticeable if I am wearing flip-flops. Once I have trail shoes or boots on they do not feel too long at all and the stretchy material makes rolling them up around the calves for rock climbing super easy. The stretchy material also stays in place around the calf while I am climbing while other pants sometimes un-roll on me mid-pitch if I don’t fuss with a good “tight-roll”. There is also a hem-cord at the ankles that can help keep them tight around your boot or calf with just one pull. These offer protection in quite a few ways. They are light enough to serve as bug/poison ivy/pricker protection in warm weather. They are durable enough to protect bare legs from rock abrasion while scrambling and climbing. They are virtually wind proof to guard from wind-chill (though I would add a hard-shell pant to my pack if looking at a wind chill advisory). They are water-resistant enough thanks to the DWR coating to deal with light precipitation and when they do get wet they are super quick drying. If glissading on Spring snow is on the agenda I would also add a hard-shell to the kit. I really like the integrated adjustable web belt and have not had any need to wear an additional belt but low profile belt loops are included anyways. The pant fits great underneath the two harnesses I used with it, the Petzl Sitta (reviewed here) and the Petzl Altitude (review coming). Two zippered hand pockets are perfectly positioned and a zippered right thigh pocket is large enough for my iPhone 6s Plus in its Hitcase Shield waterproof case <- great iPhone case by the way! There is also a zippered right rear pocket to round out the features of this pant. While I wore these for almost 5 months it was the two weeks that I lived in them in the Cascades that really won me over. Light enough to sleep in yet rugged enough to handle thousands of feet of alpine scrambling. I will likely be wearing these regularly for the rest of the New England Fall climbing season and they will probably go out on some fair weather ice climbing days this winter, though I have a couple heavier soft-shell pants that need to be reviewed this season as well. If you are in need of a versatile climbing pant backed by a great company this model deserves a very close look! Disclaimer: This product was provided to the reviewer for purpose of review and all opinions expressed are genuine. All product links above are affiliate links. Using those links to make a purchase supports Northeast Alpine Start at no additional cost to you.